Wine! A drink I love to relax with. Perfect to pair with almost any meal. A must-have in our home. When we moved into this house last fall we really missed the built-in wine rack that we had in our last house. I just love the look of a built-in wine rack. To me it says "class", it says "elegance", it says "we are prepared to relax and unwind at any given moment." It's built-in, it's part of the deal. 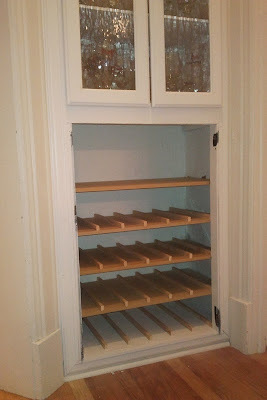 All hope for a built-in wine cabinet was not lost because this house did have a built-in cabinet. I think it was meant to store dishes, linens and towels. I thought I could do something with the lower compartment, but what? Inspiration hit when we were dining at a restaurant in Downtown Denver. They stored their wine on shelves with long skinny dowels separating the wine. I thought, "That looks so simple! I can do that!" Bought 1/2" thick boards and long wooden dowels that were 1"x 3/4". I would have preferred 1" x 1" but they didn't have that size. They come in varying lengths so you can just cut them down to size. I asked Mr. H to cut everything to size for me (I admit I'm scared of power saws!) and I started assembling it. I left the top shelf without dowels to store decanters and other wine-related items. I used a manual staple/nail gun to fasten all the dowels to the shelves (okay, I'm scared of those air compressor nail guns too!) A good tip is to cut a piece of wood to use as a spacer so your dowels are spaced evenly. Lastly, I used a simple white paint from Home Depot in a semi-gloss finish and painted the rest of the cabinet as well. And now we have a built-in wine cabinet once more! That looks sweet! :) Well done. love this idea. I'm not one to qualify as classy, but still would love to have it in my house. thinking I may do it in my kitchen's glass door cabinets. Anyway, it's a wonderful idea. I'm now your newest follower. I just found your blog through French Country Cottage. I've become your newest follower via GFC (Google Friend Connect). I love finding new blogs and I can't wait to follow your adventures. Stop by for a visit sometime or maybe link one of your posts to my Wednesday Fluster's Creative Muster Party. 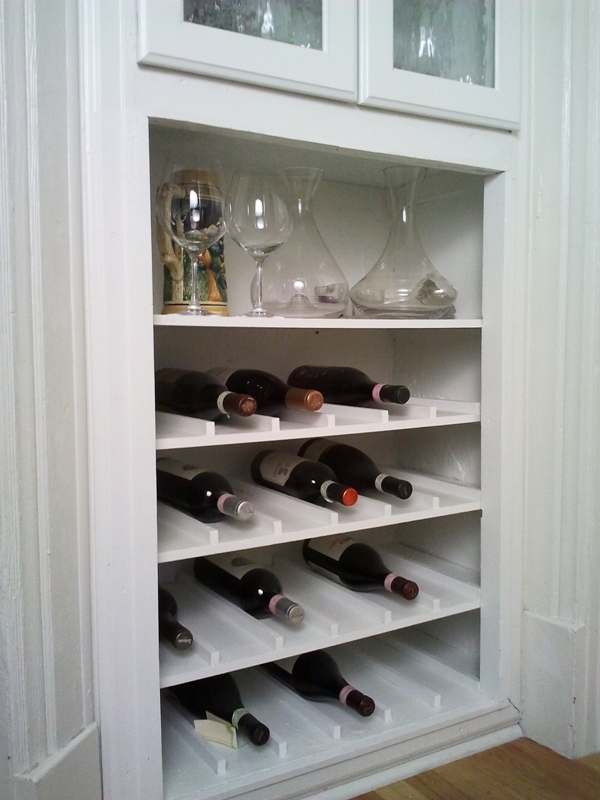 A great solution for your wine storage! MAybe someday you'll come across a small vintage iron gate that would fit the opening! Thank you for being my newest follower! I am now yours! That sounds like it would be perfect for the opening! I will have to keep an eye out for the perfect one! Thanks so much for visiting me and for following! Have a wonderful day!